Our 3 ½" Game Pencils have a pointed soft lead tip and are suitable for any score keeping game. These Game Pencils come bulk-packed and are available for immediate shipment. 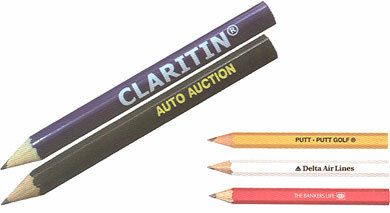 To order our 3½" soft lead pencils or more information, please contact us. No below minimum orders. (1,000 pencil min. order). Our Custom-Imprinted Game Pencils are a must have for your next score keeping game. These custom pencils are available in two styles, round or hexagon and in five different pencil colors. To order our custom soft lead pencils or more information, please contact us.